Suitable from 5 - 16 Years. Various colours available. Add a dash of colour and sparkle to your boy's communion outfit or formal suit with this satin tie, lavishly hand decorated on the front with a diamante cross. Many colours to choose from including including burgundy, gold, ivory, lilac, light pink, cerise pink, purple, red, sky blue, navy blue, silver / grey & white. Length - 45" (117cms) Suitable for boy's 5 years upto 16 years. 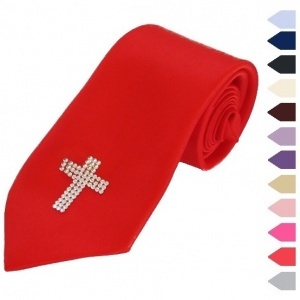 Completely brand new, perfect for a christening, communion or other religious occasion.